He Was The First Hero Of World War II And Yet The American Public Has Never Seen His Face. In 1940, with Nazi Germany on the march, William G. Sebold, a naturalized American of German birth, risked his life to become the first double agent in the history of the FBI. Intensely patriotic and cool under pressure, he spent sixteen months in the Nazi underground of New York City, consorting with a colorful cast of spies that included rowdy sailors on shore leave, a Jewish femme fatale, high-level engineers privy to America’s most valuable military secrets, and a South African soldier of fortune with an exotic accent and a monocle. The nest of Nazi intrigue was closely monitored by German spymasters intent on gaining a techno-logical edge for the Luftwaffe bombers terrorizing Europe. Meanwhile, Sebold found himself at the center of a sophisticated FBI investigation that established a short-wave radio station on Long Island to communicate with Hamburg spymasters and then set up a “research office” in Times Square that allowed agents to film meetings between Sebold and the German spies. Then Sebold disappeared into an early version of the witness protection program, never to be heard from again. His story, one of the great spy yarns of World War II, has remained untold—until now. 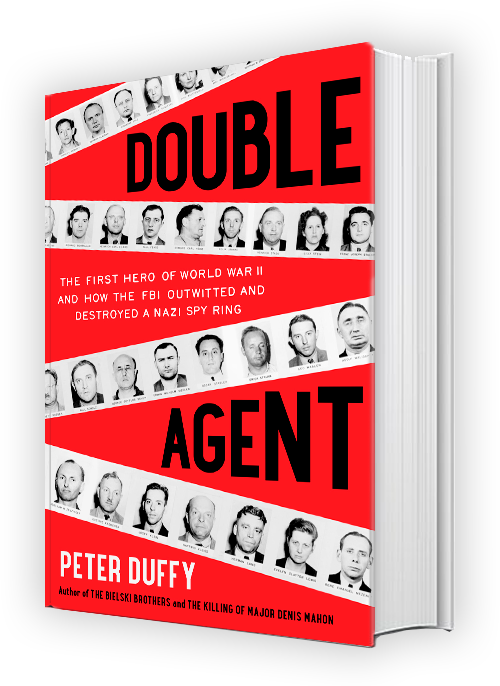 Hailed as a “captivating” (San Francisco Chronicle) and “masterful” (Publisher’s Weekly) storyteller, Peter Duffy has unearthed a wealth of original research, including thousands of pages of FBI files, and crafted Sebold’s story in fascinating and vivid detail. An accomplished journalist and historian, Duffy once again delivers a narrative with “the grip of good fiction and the punch of hard truth” (Chicago Tribune). Fantastically fast-paced, Double Agent unveils the thrilling story of one of the most successful FBI counter-espionage operations in American history. The True Story of Three Men Who Defied the Nazis, Built a Village in the Forest, and Saved 1,200 Jews.